May 17, 2017 - Click hereto view the online version. Policy committee meetings are quickly approaching. Join the ACCG policy team and your fellow county commissioners during the month of August as they undertake significant issues for possible inclusion in the 2017-2018 Amended County Platform. Mark your calendar to receive an overview on matters that will impact your respective county. Visit ACCG’s policy webpage for more information. Meeting times and locations are forthcoming. The House Rural Development Council was created during the 2017 Session of the Georgia General Assembly (see HR 389). Members of the Council were appointed by the Speaker of the House on April 19, 2017. Click here for the list of members. This Council will meet numerous times around the state during the next two years to identify policies and ideas to enhance economic opportunities across the entire state, particularly in rural areas. ACCG, the Georgia Municipal Association, the Georgia Chamber of Commerce and state universities will assist the Council with their efforts during the next two years. The first meeting of the Council will be held on May 22 and 23 in Tifton (Tift County) at the Georgia Museum of Agriculture. The meeting will run from 11:30 a.m. to 5:00 p.m. on May 22 and from 8:30 a.m. to 11:30 a.m. on May 23. Please see the attached agenda for details. The focus topic on May 23 will be the provision of broadband in Georgia's rural areas. All county officials are welcome to attend. It is important for county officials to actively participate in this effort by attending the meetings held in their area of the state. The council will be looking at issues such as rural broadband access, rural healthcare, infrastructure, education and job creation. If you have examples of challenges faced in your county or successful ways you have overcome some of those challenges, please notify Clint Mueller at cmueller@accg.org. 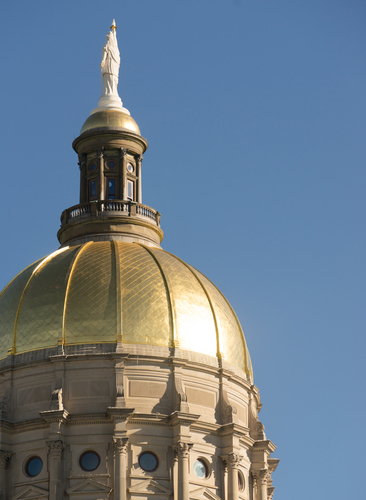 Each year, ACCG compiles a final Legislative Update to summarize legislation of importance to counties passed by the Georgia General Assembly. It is designed to serve as a guide to legislation from the 2017 session and includes a brief summary, effective dates and the county impact(s) of each bill and resolution. Please note that major pieces of legislation impacting counties have a more detailed summary in the Appendices. The final Legislative Update can be accessed here. Please contact a member of the ACCG policy team should you have any questions regarding specific legislation. Regional Water Planning Councils have developed draft updated Regional Water Plans that are available for public review and comment through May 19, 2017. The State Water Plan calls for the Councils to review the Regional Water Plans every five years. The Councils began a review and revision process in 2016 that resulted in the draft updated Regional Water Plans. The Councils considered updated water and wastewater demand forecasts and resource assessment analyses in their preparations of the draft updated Regional Water Plans. The draft updated Regional Water Plans may be viewed on the EPD website. The Georgia Department of Natural Resources is encouraging communities to take action and learn the different ways to reduce water use. As a Georgia resident, you can play a role in combating the drought by following a few water conservation tips. For the full press release visit www.accg.org. Water conservation tips can be found here. Local governments and solid waste authorities can apply for the Local Government Scrap Tire Abatement Reimbursement Program to receive funding to cover the cost of transporting and processing scrap tires that have been removed from identified, state-listed dumps where the owner is either financially unable to clean up the tires, unknown, or the local government has determined that the property owner is a victim of illegal dumping. Funds are also available to remove tires dumped on county right-of-ways and for scrap tire amnesty events sponsored by a local government. For more information on this funding opportunity, including how to apply, click here. The Georgia Department of Agriculture recently met with ACCG staff and state legislators to discuss the importance of adhering to the protocols for implementing the Georgia Agricultural Tax Exemption program (GATE). Review the tools provided to ensure that your rural communities are in compliance with the tax exemption program. The cost of living increase for county officials whose minimum salary is established by state law (i.e., coroner, magistrate, probate judge, sheriff, superior court clerk, and tax commissioner) and for county commissioners is calculated based upon the amount of cost of living increases and/or general performance increases awarded to state employees by the General Assembly in the appropriations bill. The Governor’s Office of Planning and Budget (OPB) calculates the average cost of living increases and/or general performance increase given to state employees. State employees received a 2 percent merit increase for high performing employees, which translates into a 2 percent COLA for county elected officials. Although state employee may receive their increase on July 1, 2017, the COLA for county officials is not effective until January 1, 2018. Each year, ACCG prepares a guide to assist county budget officials and payroll officials in calculating county official salaries. This guide is reviewed and approved by the County Officer Association of Georgia, the Georgia Sheriffs’ Association and the Magistrate Council. Until the 2018 salary guide is available, county officials may use the 2017 guide to prepare estimates for the 2018 salaries. ACCG and the Georgia Municipal Association (GMA) have partnered to conduct joint meetings between the associations and members of the Georgia Congressional delegation to discuss federal policy issues important to Georgia’s local governments. To date, roundtable discussions have taken place with Congressman David Scott, Congressman Austin Scott and Congressman Hank Johnson (Pictured right - in order from top to bottom). Topics discussed included protecting the tax exempt status of municipal bonds, e-fairness and broadband access. Additional meetings will be scheduled this summer. Does a single communications network that connects the 9-1-1 center to all 9-1-1 personnel from multiple jurisdictions simultaneously interest you? FirstNet will offer the ability to provide that service in an effort to boost emergency response times while maintaining the safety of citizens and responders. Using a single password with reliable network coverage, this program is intended to help public safety personnel assist and communicate more efficiently while out in the field. To read more on FirstNet, click here. NACO Steering Committees Need You! Interested in serving on a National Association of Counties (NACo) Steering Committee? NACo policy steering committees annually review and make recommendations on federal policy issues and legislation. 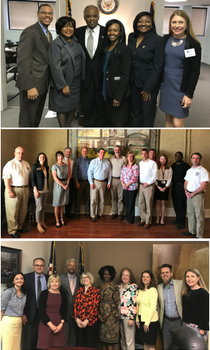 Your involvement with a NACo steering committee would give Georgia counties a voice in the NACo policy process! Committee members are appointed by state associations and serve one-year terms. The new committees go into effect in August after the NACo Annual Conference has concluded. To join, fill out the nomination form online at www.naco.org/nomination and submit to kbowen@accg.org. More information is available here. Did you miss the Final Legislative Update? Don't worry we've got you covered! Visit ACCG TV to view the final Facebook Live Legislative Update and more. Stay Tuned to see what ACCG.tv has in store! Register for the 2017 Lifelong Learning Academy Summer Sessions!